Lebanon is facing a continuous and advanced environmental degradation despite efforts and actions by specialized NGOs and the government over the years. It seems that behaviors have not yet changed. Lebanon is facing a continuous and advanced environmental degradation despite efforts and actions by specialized NGOs and the government over the years. 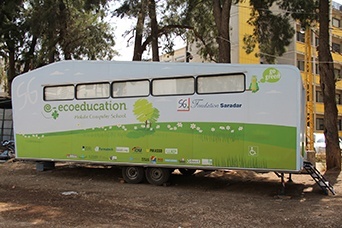 It seems that behaviors have not yet changed.Based on the success of our Computer Mobile Schools® that are continuously solicited, this innovative PC-supported “e-ecoeducation®” combines advocacy and practical applications to promote and develop environmental preservation knowledge and skills to achieve an ecologically sustainable society. “Environmental Education and Training (EET) promotes attitudes and value systems that influence environmentally ethical behavior by developing understanding, skills and values that will enable people participate as active and informed citizens in the development of an ecologically sustainable and socially just society. Environmental Education is fundamental to the achievement of the goal of sustainable development” (United Nations Environment Programme). The purpose was to create a healthier environment. Going green to protect the environment is recognized as the right thing to do and presents a crucial and strategic edge. To provide the public at large, but more particularly the young generations, the private and public sectors or other civil society organizations to go green with the required information and skills to develop, create and implement Green behaviors and policies. To introduce and disseminate on current eco problems that could lead, in time, to the creation of green businesses and hence, to the opening of new job opportunities geared towards the respect of our environment. e-ecoeducation® was implemented through IT Training session to be delivered by professional training center “Formatech” in a Saradar Computer Mobile School®.